SALT LAKE CITY, Utah, May 5, 2018 – Six young women won the all-around on the second day of competition at the 2018 Women’s Junior Olympic Level 9 Western Championships in Salt Lake City, Utah, at the Mountain America Expo Center. 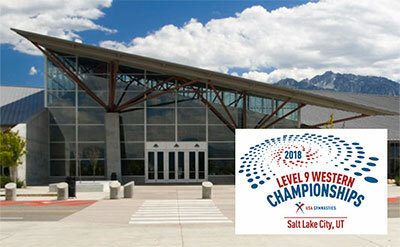 The Level 9 Eastern and Western Championships are the culmination of the Junior Olympic Level 9 competitive season, and each features the nation’s top Level 9 gymnasts in the respective regions. Junior 7 – Gold, Ella Robins, Montgomery, Texas/AIM Athletics Texans Gymnastics, 38.000; silver, Olivia Oppegard, Newport Coast, Calif./Gym-Max Gymnastics, 37.975; bronze, Evalynn Abler, Plymouth, Minn./Legacy Gymnastics, 37.650. Junior 8 – Gold, Kanna Asano, Irvine, Calif./Gym-Max Gymnastics, 38.050; silver, Elizabeth Dayton, Las Vegas, Nev./Browns Gymnastics Las Vegas, 37.775; bronze, Carly Oniki, Pleasanton, Calif./California Gymnastics Academy, 37.750. Senior 1 – Gold, Karsyn Foster, Baytown, Texas/Discover Gymnastics, 38.700; silver, Zanna Brewer, Carrollton, Texas/Kurt Thomas Gymnastics, 38.325; bronze, Gracyn Brunette, Seattle, Wash./Metropolitan Gymnastics, 37.950. Senior 2 – Gold, Jazlyn Wood, Moreno Valley, Calif./SCEGA Gymnastics, 38.800; silver, Victoria Chambers, Covina, Calif./ Gliders, 38.175; bronze, Jana Vongsamphanh, Houston, Texas/Cypress Academy of Gymnastics, 37.850. Senior 3 ¬– Gold, Kaitlin Garcia, San Diego, Calif./Mission Valley Gymnastics, 37.875; silver, Haley Ellis, Summerset, S.D./Just Jymnastics, 37.675. Senior 4 ¬– Gold, Alexa Ebeling, Adel, Iowa/Chow’s Gymnastics and Dance Institute, 38.300; silver, Isabelle Halley, Lincoln, NE/Nebraska School of Gymnastics, 38.125; bronze, Yoomee Zeng, Temecula, Calif./SCEGA Gymnastics, 37.825. Tickets are available onsite: one-day pass, adults – $25, children and seniors – $10. Children 4-and-under are free.